I’ve been looking for a new jack plane to replace the turn of the century Stanley 5 1/2 that i’ve been working with for a long while (For sale btw, if anyone is interested).. Finally decided on the Veritas Low Angle Jack.. Basically the options were the LN 62, the Veritas Low-angle jack, a LN #5 or a wood river #5. I didn’t love the price of the LN #5 and, while i’m happy with my other wood river, I wanted to try one of the low-angle jacks since so many people rave about them. Went for the Veritas mostly because I really wanted the PM-V11 Blade. Long story short, Went to Lee Valley, which is a 2 hour round trip, and purchased the new plane. First problem: Lee Valley is having trouble keeping up with the demand for the PM-V11 blades, so they offered to ship the blade in about a week once they get them off back order. Great customer service that they would ship it free, but I like to play with my toys NOW. But, fret not, i realised that i could still give it a whirl with the blade from my Veritas Bevel Up Smoother plane. Anyways, nothing I did could free the sliding toe, and with the huge hollow at the mouth, the plane was useless. I have to say that I was very disappointed. My experience with Lee Valley and Veritas Tools has always been great. I am disappointed that this managed to pass their quality control and made it into the hands of a customer. This morning, I sent a quick e-mail to Lee Valley’s customer service department outlining my disappointment that I wouldnt be able to use the plane for a small project I had lined up this weekend. I didnt really want to make a 2 hour round trip to exchange it, and I didn’t want to have to box it and send it snail mail back and wait for them to process an exchange and send another out. I got a reply within 10 minutes. They offered to ship out a new plane, TODAY, express post, so that it would be in my hands by friday. The new plane would come with a pre-paid return box to send back the defective plane. I’m sorry to hear that you had this problem. But, LV’s customer service is hard to beat. Hope the new one is right (bet it is!) Today it’s becoming more and more a tale of customer service. I bought a LN plane recently, with second (toothed) iron; order arrived with non-toothed iron. They shipped the right one ASAP with prepaid return label. Can’t argue with that… mistakes happen, it’s what you do when the happen that matters. ... someone will get their head banged a tad… I’ll BET! Once in a while they get a bad casting. If you want to use it now while you wait just put a business card between the screw and the mouth plate. When I bought my 45º accessory for the block plane, they sent me a few shims later. 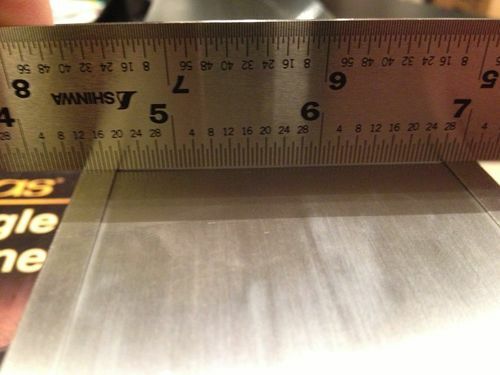 Apparently there had been some problem with the 45º plate and they were sending them just in case. It is hard to beat their service. Hope you give a review of the new one. They just had a sale on their imperfect goods so it may have slipt in with the good ones. I don’t know just a thought. With customer service like that from the “big box” of woodworking you have to love them. That sort of support would wave an issues in my opinion. This would not have been purposely sold during the “imperfect” sale. Those tools have only cosmetic blemishes. LV is not going to knowingly sell something that is functionally imperfect with the LV/Veritas name on it. I’m sorry to hear about your plane. I’ve got the same plane and it’s been fantastic. I’m truly surprised. Especially that the adjustable mouth was so non-flush to the sole of the plane. Mine is a perfect fit. My handle was pretty loose too. It tightened it and it hasn’t come loose again. I think there’s a reason they ship it with the handle loose though I’m not sure why. ChuckV is right, their “imperfects” were simply cosmetic blemishes. I question the value of giving a defective product a review rating at all… I mean, it’s defective. Most people are not going to end up with a defective tool from LV which invalidates your 1 star rating, in my opinion. It’s good to hear they handled the problem well from a customer service standpoint. Hope you re-evaluate the tool when you get the replacement. If a person buys a product from a retailer, it seems appropriate to me to review the product that was received – whether defective or not. thank you for the review about LV customer service. although I would have to say based on what you wrote LV CS should really be getting 5 stars. this review doesn’t really review the handplane in the title though – you got a defective product, and this happens to all mfg. and while some will tell you there is nothing they can do about it, you got super duper replacement service (that you won’t get from everyone). 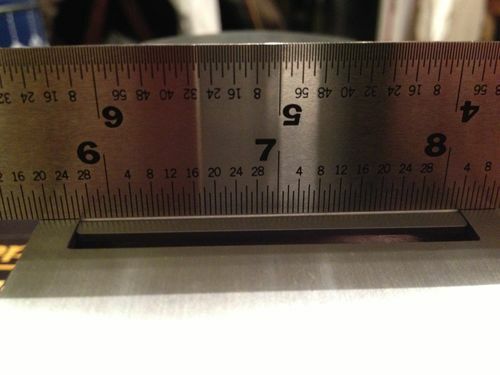 FYI, not sure if the picture you posted is misleading in the angle of the lens, but that gap is nowhere near 1/16, in fact, it looks less than 1/64 based on the ruler that you have right on top of it. (just saying). Like Mark said, I bought this from a retailer and feel that a review of what I received was warranted. My disappointment stems from the fact that this got passed QC and into the hands of a customer at a retailer that prides itself on the quality of its product. Once I get a replacement, and put in some time with it, I’ll post a new review. Until then, I stand by what I said. I bought this plane to use, and currently have a plane that is useless. Thanks to great customer service from the retailer, that should be fixed soon enough. I think this is exactly where my comment was coming from – based on your review of the product and the rating you gave it – this is just what this seems to be: the LV LA jack is a crappy tool. And from what I’m getting you are NOT a novice. If this was a review of LV quality assurance, sure, I think you were spot on. I’ll take it one step further based on your latest comment. suppose a novice is looking for a Jack plane, he’ll do research on LJ, and notice that the LV gets low rating, whereas some knockoff plane gets higher ratings, do you think that assessment would be correct? I think this OP was absolutely right to make the review he did. If LV starts sending out tools that don’t meet their high standards, we should know about it. This isn’t happening, and I am still a great LV fan. But we all bought some pretty crappy American cars in the 70”S because we couldn’t believe America would make a sub par automobile. The did. If one of you received a wood river or new stanley plane with these types of issues, I doubt it would be treated any differently. He received a product that was unacceptable, and he told us it was unacceptable. Frankly, I was shocked when I saw a Veritas LAJ review with one star, so I had to read it. As to a novice researching this plane. If a novice bases their research on one review, or let’s this one review hold a lot of weight against the multiple thousands of exceptional reviews on this tool, then they get what they deserve. Just as this review was warranted, it falls on the original poster to review the plane he gets from LV when he gets it, and if there are problems there, he should let us know. He has committed to doing this. I doubt he will be let down. We all love LV and LN, but that doesn’t mean they can’t make mistakes. The great thing is ther exceptional customer service. Regardless if someone thinks this review should have been posted or not is pointless. If you don’t like it keep scrolling. If someone was seriously looking for a plane then they would put in the time to check out exactly what they are looking for.